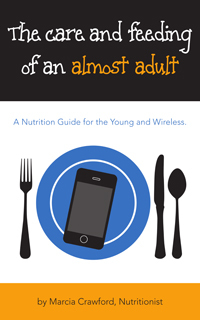 This concise gem tells the newly independent young person everything he or she needs to know about nutrition, grocery shopping and cooking. Leaving high school or college with no clue in the kitchen? This is absolutely the best book for you. Read it (and laugh) in a single sitting. Learn how to stock your first kitchen. Take it to the grocery store with you. Cook easy healthy meals with its recipes. It’s everything your mom wants you to know! 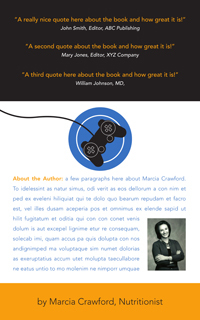 Marcia Crawford is a registered dietitian and earned a master’s degree in education. She is member of the Academy of Nutrition and Dietetics. Crawford has taught nutrition to college students for over two decades and enjoys making the science of nutrition understandable and fun to all. Crawford’s weekly column “Eat Right” was published for years in The News Sentinel, Fort Wayne, IN. She blogs at MarciaCrawford.net and has an Almost Adult! Paperback and Kindle versions are available on Amazon.com here. Now available on iTunes for your iPad here.